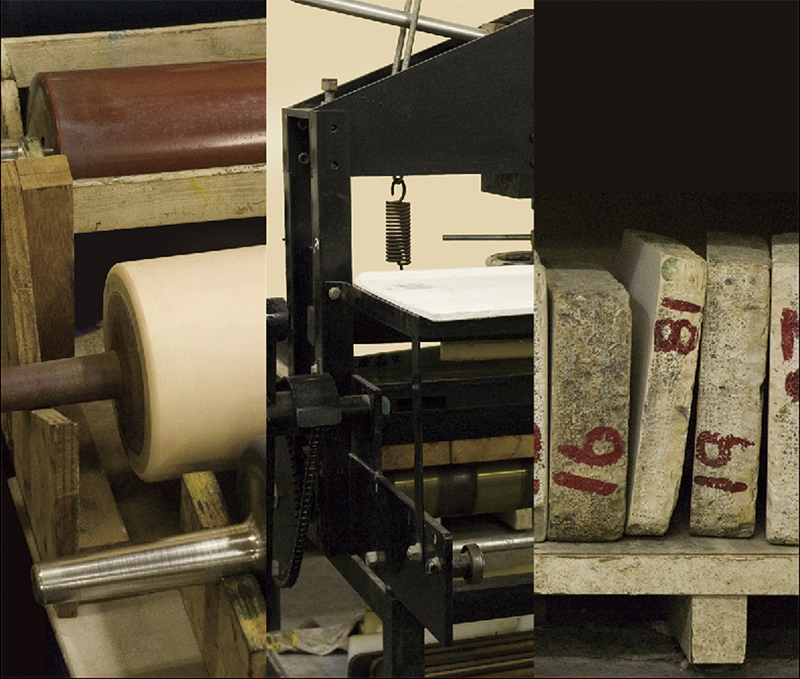 Lithography is a method of press printmaking that utilizes printing surfaces (planographs) made of such materials as lithographic stone (limestone) or metals (aluminum or zinc plates). The process makes use of water and oil’s natural propensity to repel one another by using a chemical process to separate areas that will attract ink from those that will retain water (and thus repel ink). This process allows prints to be made more-or-less directly from printing surfaces upon which pictures have been drawn directly. Aloys Senefelder (1771-1834) invented this process in 1796 after trying to use soapy water to remove a simple note that had been transferred using acid to a lithographic stone; by 1798 he had perfected the technology. The basic process of making a lithographic print involves drawing on a lithographic stone or a metal plate using an oil-based medium such as a wax crayon or lithographic ink, and then putting the printing surface through a chemical process that will divide the surface into hydrophobic, ink-attracting regions (the drawn portions), and hydrophilic, ink-repelling regions (the portions lacking drawing). When ink is applied using a roller to this prepared surface, the hydrophilic portion will repel the ink, which will adhere only to the hydrophobic portions. In this way an image may be reproduced by placing paper on top of the inked surface and then applying pressure using a press. Originally lithographic stones were made of stone excavated from the Solnhofen quarry in Germany, however in Japan, as a result of increasingly large prints and material factors, the use of metallic plates (aluminum plates) has become widespread. New materials and methods continue to be developed, including wood lithography, in which specialized tools are used on a wooden surface that has been chemically treated, and waterless lithograph, which uses a silicon masking technique on the portions lacking drawing to eliminate the need to use water.